Nelson treated fans to old favorites including “Ain’t It Funny How Time Slips Away”, “Mamma’s Don’t Let Your Babies Grow Up To Be Cowboys”, “On The Road Again” and “Always On My Mind”. He introduced “Good Hearted Woman” as one for Waylon. Of course, he got a huge response with this famous line “And at the airport in Milwaukee, they refused to let us board the plane at all” during “Me And Paul”. Relatively new songs “Superman” and “You Don’t Think I’m Funny Anymore” were as well received as his classics. 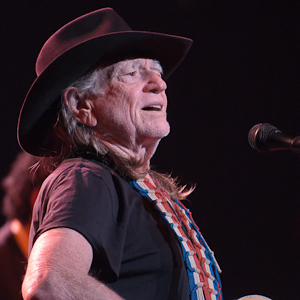 Along with his own music, Nelson covered other greats such as Hank Williams’ “Jambalaya” and “Hey, Good Looking”, Kris Kristofferson’s “Help Me Make It Through The Night” and “Me And Bobby McGee”, and Ray Charles’ “Georgia On My Mind”. Certainly, no tent revival would be complete without some good old fashioned spirituals. The congregational sing-along was in full force for “I’ll Fly Away” and “Let The Circle Be Unbroken”. Nelson closed the meeting with “I Saw The Light” then spent several minutes signing autographs and shaking hands of his fans before ending the night and leaving all who attended feeling revived but still wanting more. Opening for Nelson was Illinois native Brett Eldredge, an up and coming country singer-songwriter best known for his sentimental single “Raymond”. He performed a laid back half hour set backed by two guitarists and a percussionist. Eldredge captured the audience’s attention like a main act instead of the opener. I look forward to hearing more from this talented artist in the years to come.